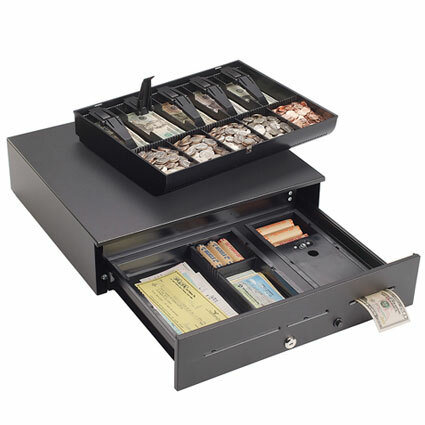 The MMF Advantage manual cash drawer provides versatility and portability while maintaining high security. 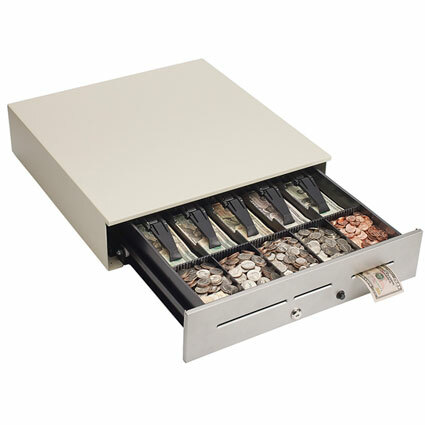 Able to open without printer or computer input, this manual cash drawer is a great choice for mobile kiosks, trade shows, or secondary bar cash storage. 3 media slots allow for easy check/document storage, and the LockIt cash drop compartment gives you a secure slot for large bills. The 18-20 gauge steel constructed body provides the sturdiness and stability required for rough locations, and the scratch resistant powder coating - in your choice of black or beige - keeps the Advantage looking classy over its lifetime. A 4-million operation life cycle ensures many years of easy operation from the MMF Advantage manual cash drawer. A printer-driven version of the MMF Advantage is also available. <li> Black, Putty, or White <li> 3 media slots <li> 5 bill/5 coin American tills, 4 bill/6 coin Canadian tills <li> 3 year warranty <br><br>A printer-driven version of the <a href="https://posmicro.com/pro/822/mmf/advantage">MMF Advantage</a> is also available.